Even for photo shoots for the Gal Meets Glam Collection, I rarely switch up my makeup routine. I always feel my most confident when my makeup looks natural and simple, so even when I’m going for a more dressed up or all-out “glam” vibe, I tend to stick to what I know works and makes me feel like myself. I design the Collection dresses to be the best representation of my personal style, so it’s only fitting that I wear my go-to makeup in the photos we share with you! The one beauty product I do love to switch up frequently, though, is my lipstick. Lip colors can totally transform the look of an outfit, without having to make any other beauty changes. I love testing out different lipsticks for each dress while planning our photo shoots–it’s so important to me to land on the perfect overall look for your first impression of each dress. I encourage you to do the same, both with your Gal Meets Glam Collection dresses and anything else in your closet! Do you want to keep the focus on the print of your Edith dress by opting for a neutral lip, or play up the berry shade of Celeste with a matching shade? Do you want the Blanche dress to look retro (add a cherry red lip) or modern (opt for burgundy)? This one beauty product can make each and every dress in your closet even more versatile. For a little dose of inspiration (or a starting point, if you’re not already a big lipstick wearer), here are the four lipsticks I wore in the September Gal Meets Glam Collection shoot. I was determined to find a warm, creamy mauve lipstick that I could wear when I wanted a subtler color that still looked special–not all lipsticks have to be bright in order to make a statement. I knew I had found the one when the color of Laura Mercier’s Velour Lover Lip Color Lipstick in Infatuation reminded me of the roses on our jacquard Ingrid dress! I also paired this shade with the Paige dress for a look that would be perfect for daytime or the office. Edith and Chloe feature two of the most incredible prints from the September collection. My go-to Bobbi Brown lipstick in Cali Rose ended up being the ideal dark mauve shade to play up the raspberry and burgundy hues on both dresses–picking up just a hint of it from the Chloe dress and making more of a statement with the Edith dress. I love the way these looks turned out! Burgundy is one of my favorite colors to wear in the fall, and that certainly extends to beauty products. After trying out a few shades of burgundy lipstick, I landed on Bobbi Brown Crushed Lip Color in Plum. I wore it with both the Blanche dress and the cream Celeste dress, and even though the dresses have such different feels, this creamy matte lipstick wound up being an elegant and polished finishing touch for both looks. There was no way I could resist a tone-on-tone look when I chose a lipstick to wear with the Celeste dress in Berry–the rich color of the fabric is too inspiring. This raspberry-toned Bobbi Brown shade was just right and made a gorgeous statement. I also wore this lipstick with the Natalie, since a bold lip put an autumnal spin on this versatile mauve dress (in the spring, I’ll switch it up with a lighter, peachy pink lip). 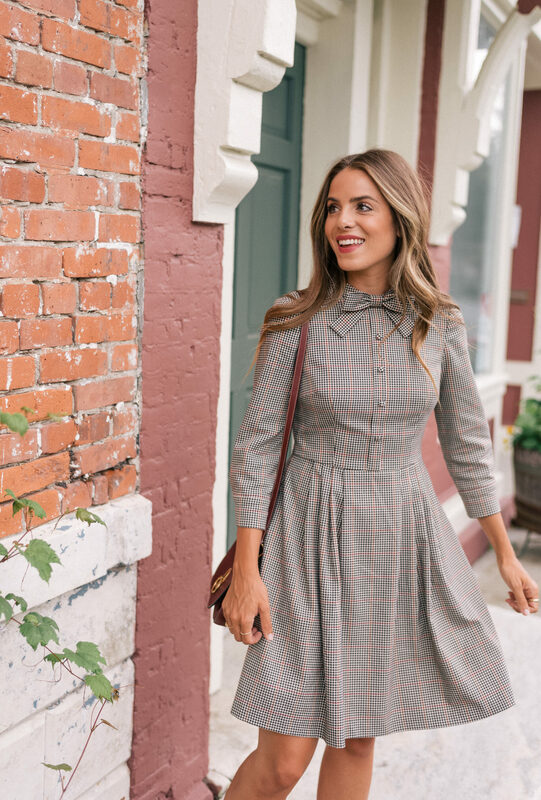 Be sure to tag @galmeetsglam and use #gmgonme on Instagram so I can see the ways you style your September dresses, plus the lipsticks you pair with them to create all different looks! Great choices – love the plum one!! Can’t believe how beautiful are all these wonderful dresses! Super fun post! Love the Laura Mercier color – so beautiful! Lovely lipstick colours .. love ♥️the deep plum shade! Such good lipstick shades! I love the last one. Love all of these colors! I have such a hard time finding lipsticks myself but I absolutely love these! These are all great parings. I like how thought-out each look is. All the shades are beautiful, Julia. And they go so well with the dresses! Great post! All these lip colors are gorgeous, and you wear them so beautifully. You have that skin tone where you can get away with any color. Thanks so much for sharing your lipsticks! They were gorgeous!! Love the shades you picked up! In love with all of these pretty lip colors! <3 :) They're perfect for the fall! And these dresses are sooo feminine and beautiful! I’ve been meaning to try some Laura Mercier products, so I’m excited to pick up that lipstick next time I’m in Sephora. Thanks for sharing your choices! This is an amazing post! The shades are oh-so-perfect!